ChiroThin™ is a natural dietary supplement. Its formula contains a host of nutritional ingredients that are well known to aid in fatty acid transportation, fatty acid metabolism, and blood sugar stabilization, as well as increase metabolism and detoxification. When ChiroThin is combined with healthy and specific amounts of anti-inflammatory foods with a low glycemic index, your body will be more efficient at converting stored fat into energy. If you want to lose 20-35 lbs. in just 42 days, the ChiroThin Weight Loss Program is going to be perfect for you! Call our office today to schedule your free consultation! Unlike lower-grade products, you will not find our products being sold online or by other companies. We have worked with our formulation team to create only top-shelf nutritional dietary supplements. We do not import any ingredients from overseas. Our supplements are manufactured in the United States in a pharmaceutical grade facility. 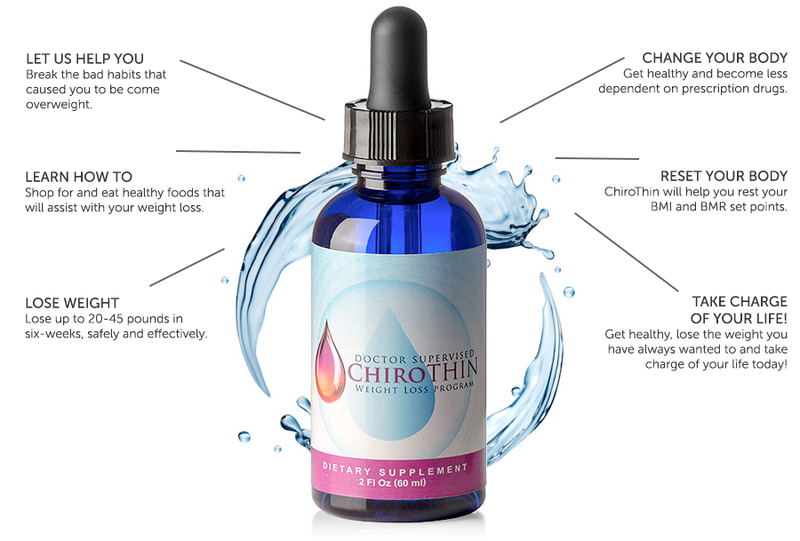 The ChiroThin formula is proprietary and uses nothing but high-grade ingredients. Our unique formula has many advantages, such as added natural appetite suppressants, energy supplements, detoxification, lean muscle protection, and more. This carefully designed formulation optimizes the weight loss plan. "I've been on a diet or cheating on one since grade school. Until ChiroThin I had no hope I would find something to help me lose the weight and keep it off. Chirothin did it! I was so inspired by my own success I started Dublin Weight Loss & Wellness to share what worked for me with you." ChiroThin drops are all natural and so is the food you'll eat while on the program. You'll eat healthy whole foods in specific amounts. This blend of low glycemic, anti-inflammatory foods, and the ChiroThin drops will allow your body to become extremely efficient at converting stored fat into energy.